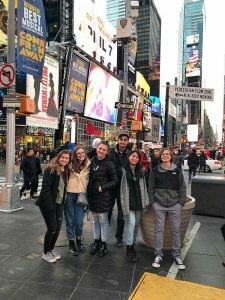 The weekend of March 20-23, six staff members from The Voice and huntleyvoice.com attended the Columbia Scholastic Press Association’s annual spring conference in New York City. There, the staff picked up their third consecutive Silver Crown Award in the Magazine Hybrid category. Crown Awards are one of the most prestigious awards in high school journalism, similar to a Pulitzer Prize. The Voice was one of eleven schools in the nation to win a Crown in the Magazine Hybrid category, and one of nine in Illinois to be awarded a Crown Award (the others were University of Chicago Laboratory Schools (newspaper), Glenbrook South (yearbook), Niles West (digital news), Antioch (news hybrid), West Chicago Community (digital news), Naperville Central (hybrid news), Prospect (hybrid news), and Hinsdale Central (hybrid yearbook). Dennis Brown, adviser of The Voice, put the award in perspective. Brown also did two presentations at the convention, one on law and ethics and a second on recruiting and marketing. 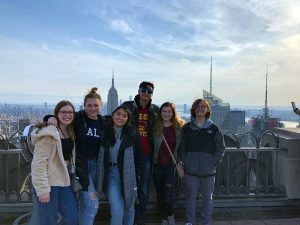 While in New York, the group also did some sightseeing. 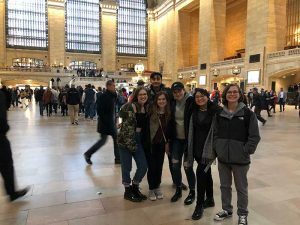 They visited Grand Central Terminal, Washington Square, Rockefeller Center, St. Patrick’s Cathedral, Times Square, the Statue of Liberty, and the 9/11 Memorial. 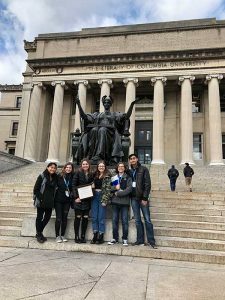 “Each of these experiences provided me with more appreciation of where our country came from, what we have built since, and where we will continue to flourish,” social media editor Ashley Reilly said. After the awards ceremony on Friday, the group traveled to Central Park and spent some a few hours at the Metropolitan Museum of Art. The award will be displayed in the newspaper display case in the commons area of HHS.